Where is Maple? 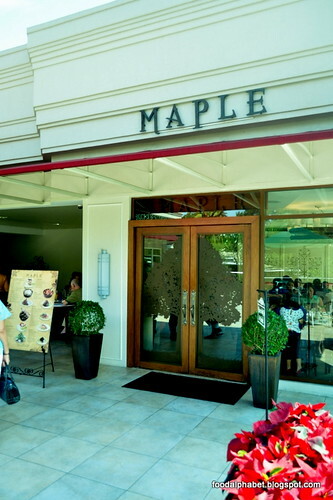 Maple is nestled in the quiet but busy neighborhood of San Antonio Plaza in McKinley Road, Forbes Park, Makati City. They have been open for a few months and as you can see from the lines that they have indeed gained a following. Why? Well, simple! They serve great food. 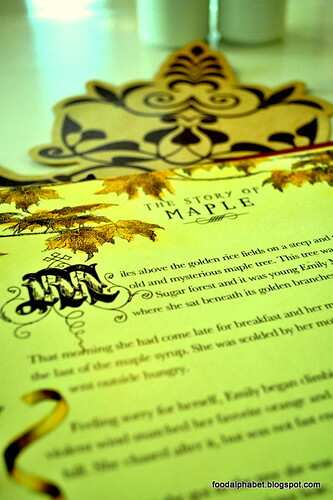 So what does Maple serve? Savor their all day breakfast treats, zesty appetizers, pasta and sandwiches with more choices on main entrees but of course don't forget desserts! 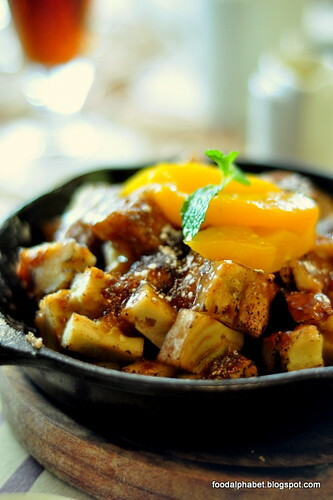 Breakfast nowadays is more of a privilege as most of us due to our busy schedules and hectic lifestyle do miss out on breakfast, that's why it's perfect that Maple serves the breakfast treats all day. 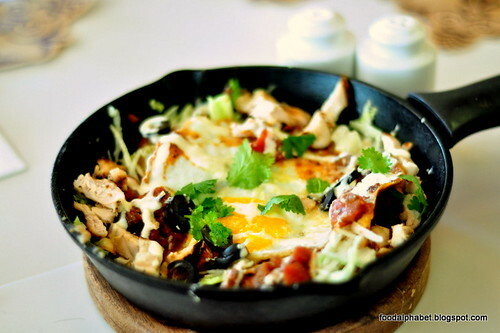 Let's start off with their Huevos Rancheros (P340), a classic Mexican breakfast made with tortillas, refried beans, grilled sliced chicken and a sunny side up egg, topped with cheese and ranchero sauce served on a skillet. I live how it's presented, but given that I am not a fan of eggs, I just tasted some of the tortillas with chicken strips, which turned out pretty good. 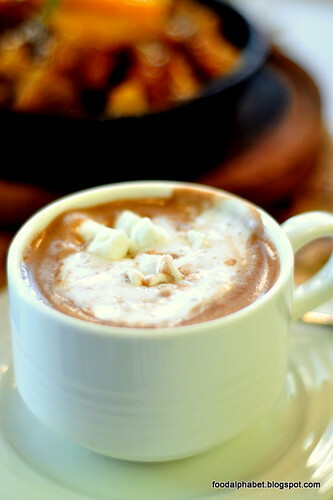 Make sure to order this, the Chili Soup (P250), maybe on the pricey but trust me it is all worth it. 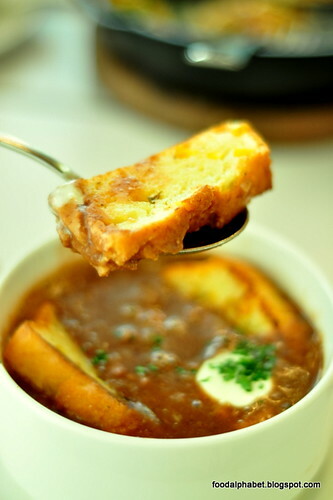 Don't worry, this mild bean, chili soup with beef and pork sausage, topped with sour cream, scallions, and a slice of freshly baked jalapeno corn bread, (Now that's hot!) does not even have one bit of spice in it. The soup was so delicious, I knew it only took me 3 minutes to finish one whole bowl even while it's hot. Don't even let me get started with the bread, it was amazing, surprising as it may be, I would never thought the jalapeno corn bread could taste so good, soft, crisp and oh so tasty. Try their Maple Bacon Carbonarra (P350), and a tip for you order extra bacon, I'm sure you will be "bitin" when you finish the 2 slices of bacon on your pasta. 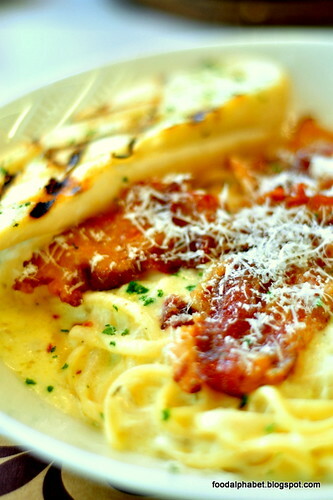 This linguini pasta covered with creamy Parmesan sauce is the perfect companion to your crispy maple glazed bacon. This is just genius! 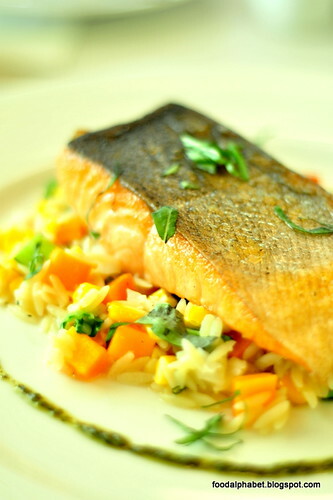 Well if you're looking for something else other than breakfast treats, you may try The Maple Salmon Catch (P550), a fresh salmon fillet, seasoned and pan-seared and served with Texas summer vegetables and orzo pasta. The Blacked Chicken (P450), somehow I don't get the name of this dish, but as said it is called as such, because the chicken was grilled on its spread to a black, much shows from the grilling that you see. 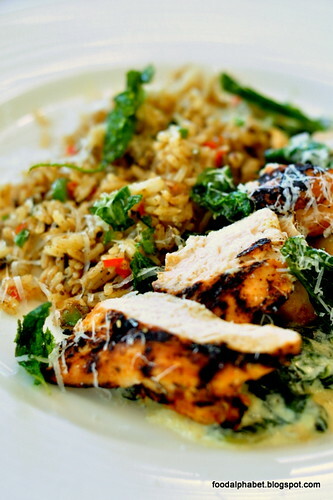 Served with creamed spinach, bacon and dirty rice is a welcome addition to the hefty food choices that Maple has to offer. 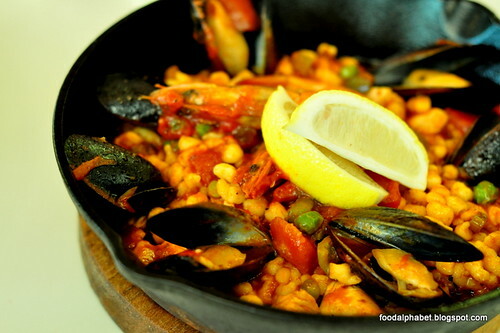 Another pasta treat would be the Spaetzle Jambalaya (P390), with fresh Spaetzle pasta made with Maple's own Jambalaya sauce, topped with shrimps and Chilean mussels. 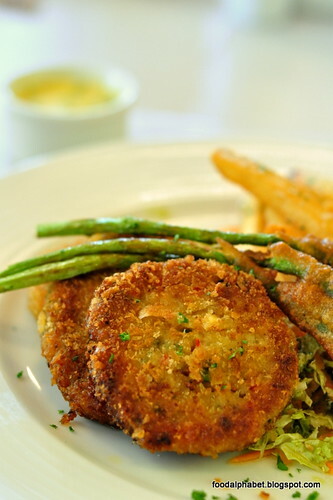 Maryland Crab Cakes (P590), fried crab cakes, served with chive hollandaise, Napa cabbage slaw and Bistro fries. 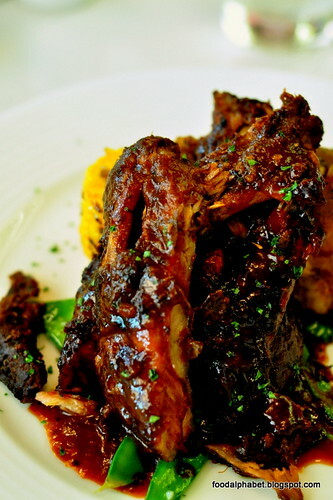 And the Drippin' Baby Back Ribs (P850), slow roasted baby back ribs basted with a special homemade barbecue sauce, served with snow peas, cheesy baked potato and corn on a cob. A full meal indeed, you get a mouthful with this tasty piece of prime meat. I feel that this may be on the pricey side, but well some people just know how to enjoy their food. 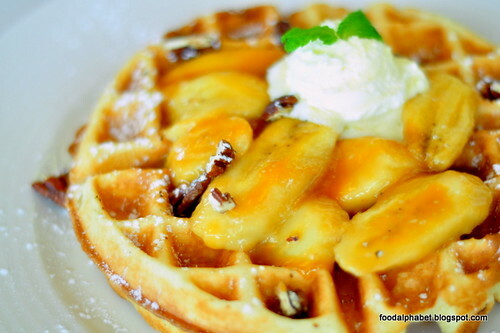 Banana Pecan (P335), thick Belgian waffle topped with caramelized then flambeed bananas and maple-glazed pecans. Soft and warm Belgian waffle can never go wrong, but Maple does it so right with the right ingredients and tender loving care. Blueberry and Cream Cheese Pancake Tower (P450), a tower of 6 buttermilk pancakes with alternating layers of preserved blueberries and thick cream cheese topped with blueberry compote, takes out all the sorrows from me and brings me back to my childhood days. 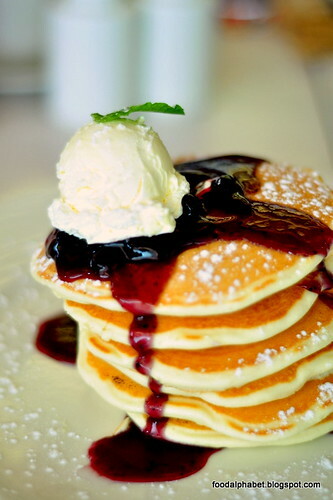 Oh I love these buttermilk pancakes, so creamy, tasty and best of all sweet!!! Maple gives a whole new meaning to breakfast, when in times like these where breakfast is often times taken for granted, you can only wish you had more time to have breakfast knowing what Maple has in store for you. Bring out the kid in you and enjoy breakfast all day long. Looks like a great place to dine in. The shot of the Baby Back Ribs got me hungry just by looking at it.